are here to share Goddess tips and empowerment exercises to tap into the ancient wisdoms and grace of Goddess Consciousness. Empowering ourselves and owning the creative life force that is our birthright. Learn the tools to generate, harvest and expand us into new energy -a new paradigm. Directing the love and light from our hearts to Gaia. This act alone grounds us into our own Goddess self. In preparation for our Grounding Into Goddess weekend retreat in California at Lupin Lodge in Los Gatos in May 2019. Rev. 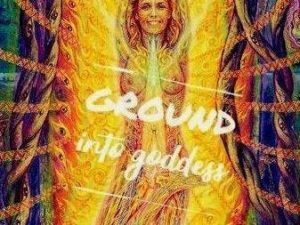 Goddess Charmaine and Goddess BE ~ Beth Nolan are inviting all ladies to join us on this Zoom Call to start creating the immersion connection with Gaia and the Goddess within. We will spend 45 minutes together online on Zoom and get into body movement with some Yoga. Specific posters for women that Goddess BE will guide us through. Developing your Holy Body Spirit Consciousness with Rev. Goddess. Our connection to Gaia is how Goddess assists us. Grounding Into Goddess gives us the time we need to heal and open our hearts, nourish our souls and be present to our own needs first. We are interested in hearing and sharing some personal women issues. Then energetically learn how our connection to Gaia is how Goddess assists us. Our Hearts and Spirits can build a sisterhood consciousness which brings us into healing, psychic development and personal growth. You will receive be the Zoom LINK. Please respect our time and Be On Time. Only request Link if the Time is right for You. Please send your first and last name when you RSVP for Zoom Link. You can still join the call and Ground Into Your Goddess.